Violence in America has evolved into a "natural" phenomenon; it’s been assimilated into our national identity. 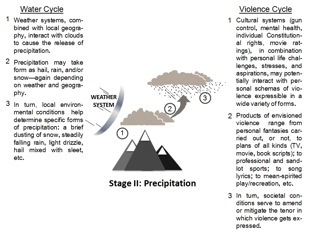 Violence, as we live it, mimics earth’s cycle of precipitation, commonly known as the water cycle. You’re probably familiar with illustrations of the water cycle: how snow and rain repeat themselves across three stages in a cycle that replenishes earth’s demand of a continuous water supply. Water Cycle Stage I—Evaporation-Condensation. As seen above, the sun’s heating of ocean and lake water produces vapor; in turn, it rises into the atmosphere where some of it condenses into clusters of various forms, what we call clouds. In the violence cycle, we substitute the word normalization for evaporation: meaning, we’ve made violence a normal fixture in our lives. Daily, we choose individually to let our sensibilities get bombarded by acts of violence on the national, regional, and local levels; both through the news media and an insatiable appetite for violence through its many outlets: popular TV series; action, horror, drama, and suspense movies; professional sports; book fiction and nonfiction. With rubber-necked fascination each act - like water vapor - has the opportunity to condense in our individual short- and long-term memories. These acts of violence begin to cluster as semi-recognizable patterns, or schemas: assaults with automatic weapons; muggings/robberies; beatings; bombings through explosive materials and by converting vehicles of transportation into explosive devices; knifing attacks; suicide by cop/gun/jumping/wrist slashing; poisonings; barehanded and martial arts assaults; assault using a weapon of opportunity; mutilations and torture; live and Internet bullying; gang violence; and hate-crimes against persons of color/ethnicity/gender orientation. Sadly, by adulthood, each of us is saddled with a full photo album of crude mental images representing these various modes of violence. 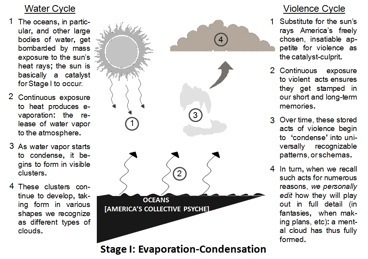 Returning to the water cycle, pockets of condensing vapor eventually take substantive form as recognizable clouds located at different altitudes in the atmosphere. In the violence cycle, "substantive cloud formation" happens each time we select some act of violence from our personal montage of schemas and edit it to suit a personal need: entertaining a retributive fantasy of verbal or physical attack; envisioning a rudimentary plan for exacting revenge; authors scripting plots for the entertainment industry; songwriters penning cruel song lyrics; persons who passive-aggressively craft lies, hurtful stories, and rumors; and so on. To whatever form actual violence may materialize remains to be seen; or it may dissipate harmlessly just as clouds often do. Brazen commercialization of TV news reporting - including some talk show commentators - on violence as though it can rightfully be treated in the same intriguing manner artfully done to violent entertainment, to ensure high volumes of consumption in several movie genre markets. On several fronts, then, violence as a cultural mainstay does not bode well for domestic tranquility when interacting with the aforementioned societal systems. Hypocritically, we say we cherish peace-loving ideals, yet blatantly radiate the opposite in our preferences for sports, entertainment, and our globally-perceived too-easy willingness to enter into armed conflict with nations seen as threats to our national interests. The asinine logic that "right to bear arms" surely includes assault rifles, then surely why not mortars, RPG launchers, and throw in federal vouchers to legally possess up to sixteen ounces of Semtex? Perhaps the same asinine logic perpetuates over-the-top graphic dramatizations of terrifying acts of violence given 360-degree coverage in the news media; supplemented to a fault with inane questions about "why" such an act could have been perpetrated. As though knowing the perpetrator’s motive can somehow rescind the act itself, or lessen the grief, or mystically render the next odious act a minor probability. Not so. Media coverage has devolved to become more about who first seizes the lion’s share of an unwary regional or national audience’s attention. With one in five Americans suffering from a mental illness of some sort: paring down from sixty million individuals to those with deranged axes to grind, and who’ve thus far slipped through both the mental health and Homeland Security nets, that still leaves more than a handful presently dreadfully unaccounted for. With that disturbing thought left floating, these many modes of violent downpour get steadfastly fed back to America’s population-at-large in Replenishment Stage III. Water Cycle Stage III—Replenishment. As seen above, this is where surface runoff from snowmelt and rainfall feed rivers, streams, lakes, seas, and oceans; in turn, many feeder streams and rivers empty into oceans (which provide about 80% of much-needed evaporation). A second replenishing outlet is groundwater channels that also eventually empty into oceans and seas. 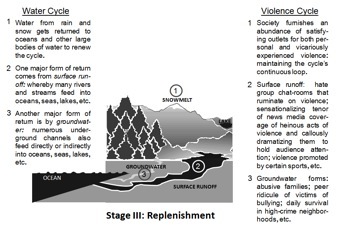 In the violence cycle’s Stage III, substitute for surface runoff these vicariously-experienced, high-visibility feeders of violence, quite visible at every corner in American society: Internet chat-room nefarious discussions laser-focused on hate, delivering payback, and the like; also insensitive, hurtful discussions, rumor-starting, and other actions prolonging or exacerbating initial acts of live and Internet bullying; again, the widespread theatrical tenor and wording used by news agencies/networks’ reporting on gruesome acts of violence without moral consideration of their highly-charged potential influence on mentally-disturbed viewers; let’s not forget how, from elementary-school upward, we continue to promote violence as acceptable in certain sports without regard for their moderate-to-high probability for incurring serious injury or worse: pro wrestling, football, hunting, ice hockey, etc. - and not to omit those newsworthy sideline clashes between teams, with fans in the stands, etc. Regarding groundwater channels in America’s violence-cycle, these "underground" sources keep violence viscerally alive deep inside American culture’s most insidious and vulnerable nooks: boldly displayed gang tattoos and various unsubtle threats of retaliation in turf wars; social ridiculing of victims of Internet and school bullying - which then fans more bullying antics for public enjoyment; the gut-wrenching tensions of daily dodging harm and barely surviving high-risk episodes in violence-studded neighborhoods; the kinds of workplaces that turn a blind eye to acts of racial/ethnic/gender prejudice and harassment; a prevalence of abusive family environments under the oppressive control of a sadistic parent, relative, or sibling; the "normalcy" of viewing local TV and newspaper reports of domestic violence, road rage, convenience store robberies, next-door-neighbors’ altercations, and so on. 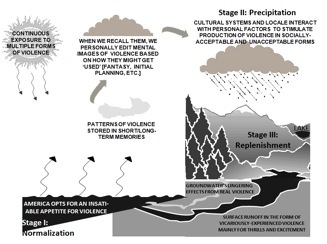 What you hopefully take away from this naturalistic metaphor - summarized in the illustration, below - is, that until American culture changes its freely-chosen violent identity, the violence cycle remains self-perpetuating and unchecked in its readiness to release the next horrific blow to some unsuspecting segment of society with absolute certainty. It takes a social movement - at grass roots level - to achieve momentum at critical mass, and successfully enact changes by social vote - for example, by boycotting sources of entertaining violence - and by law. One clear example, Mothers Against Drunk Drivers (MADD) successfully got a law passed against drinking and driving. Until America finds healthier alternatives to its violence-centric pastimes, its national character will continue to cycle through contemptibly new episodes of unprecedented acts of violence. Violence’s downpour will continue to befall us in unspeakable ways unless we reinvent who we are and what we individually choose to fill our leisure and entertainment time. Like the self-absorbed juvenile, none of us relishes the idea of a curfew on personal time spent enjoying violent entertainment; we eschew the idea of new boundaries being imposed on our freedom to experience. Yet, unfailingly, anyone with an eye for detail will affirm how we - the general public - do not comprise persons of equal maturity and responsibility. Collectively, we’re not fully adult and responsible in all things interpersonal and cultural. Nor are our laws adequate to the task, they can’t deter with 100% accuracy, which is where social mores and social pressure/voting are supposed to step up, preventively. Americans can no longer hedge their bets on each new day’s outcomes by placing blind trust on both ends of the probability continuum: buying lottery tickets en masse, believing that you actually might defy impossible odds by holding the winning ticket; then, and without pause, you shun all probability that America’s continuous loop of real and vicariously-experienced violence will ever put you, your family, your friends and coworkers in harm’s way: say, at the shopping center, cinema, school, workplace. It won’t happen to you and yours. Such a horrendous threat and its proximal urgency are unreal, too abstract. Despite the reality that across America tens, if not hundreds of thousands, of some sixty million mentally-ill individuals have not found help; or aren’t getting the right kind of help to fit their profile; or aren’t getting treatment fast enough to outdistance some recurring, disturbing self-fulfilling fantasy; or perhaps their efforts have proven inadequate to the surrogate task of adopting a socially-acceptable outlet for channeling violent tendencies. In addition, we explicitly or implicitly accept aggression-violence as a ubiquitous partial/whole solution to many contemporary problems: in TV/book police procedural series, mysteries; in action and horror series; in TV programs of American law and medicine; in raw comedy and in sports - the underlying message is that aggression/violence is part if not a total solution; despite the fact that violence is also often accurately portrayed as a root problem. In a free, extremely self-aware society where its citizens navigate through life unequally on so many levels, many are destined to be subjected to neglect, victimization, and wrongful treatment. Loss of hope accompanied by a polar rise of despair is potency enough to transform someone’s violent fantasy into nightmarish reality. Persons without social support, without access to, or knowledge of, helpful resources, and seeing no bright turning point within human reach, may be prone to convert gratifying imaginary episodes of victorious reprisal, however distorted their content, into meticulous plans for regaining a sense of power and control; for exacting revenge - real or imagined - to be visited upon some targeted group of fatally-accused or stand-in offenders. Having lost all semblance of our innocence a few decades ago, are we ready to reach majority consensus on unconditionally surrendering our R-rated penchant for living life at the pleasure of unrestricted access to violence in our entertainment and in, or on the periphery of, our neighborhoods, public gathering places, and workplaces?